In 11x8-inch baking dish, soak skewers in water at least 30 minutes. Meanwhile, in 1-gallon resealable food-storage plastic bag, mix oil, lemon peel, lemon juice, thyme leaves, salt and garlic. Slice beef across the grain into 1/4-inch strips. Place beef in oil mixture. Seal bag; refrigerate 2 to 4 hours to marinate. Meanwhile, in blender or food processor, place sauce ingredients. Cover; blend on high speed until smooth. Thread beef on skewers, twirling 2 to 3 beef strips around each skewer to look like worms. Reserve any remaining marinade. Set oven control to broil. Place skewers on broiler pan. Broil with tops 4 to 6 inches from heat 3 minutes. 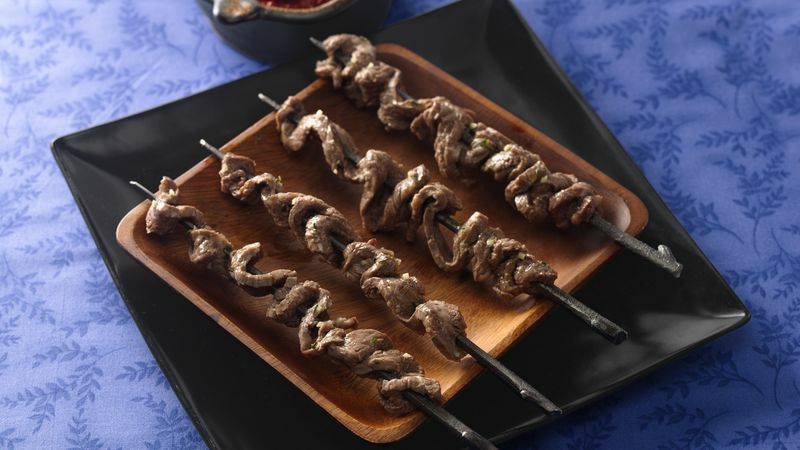 Turn skewers, and brush with marinade. (Discard any remaining marinade.) Broil 2 to 3 minutes longer or until desired doneness. Serve with sauce. Flank steak is a less tender cut of beef with really great flavor. Because it is less tender, it usually requires marinating. For easier slicing, place steak in freezer for 1 hour or until firm but not frozen; slice thinly across grain of meat.